If you have some small valuables to store, one of the most convenient options is the use of a drawer safe. 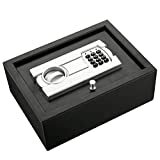 This is simply a small safe which you can stow inside a drawer. If you prefer, you can place it in a cabinet or closet, or even another safe. Many of them are sized to fit lockboxes, handguns, or media. Because they are so small, they can be relocated as necessary, or even brought with you if you require a portable option. If you prefer to keep the safe in one location and want to make it even more secure, you have the option of mounting it inside a wall as well. 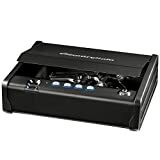 To speed up your search for the best drawer safes, we have put together a comparison table of top drawer safes for 2018. If you are not yet ready to shop, and want to know more about the features and considerations which you need to evaluate when selecting a drawer safe, read on. We will teach you everything you need to know in our comprehensive drawer safe guide below. 1. What do you plan to store in your drawer safe? Figuring out what you will be keeping in your drawer safe is an essential first step in the buying process, since it will determine many of the features you need. Storing data is different from storing a handgun or cash. While there are a lot of safes which are ideal for multiple purposes, some are certainly more suitable than others for specific goals. 2. Where will you be storing the drawer safe? You need to figure out where you will be putting your safe in order to choose one with the right dimensions. Also consider whether you want to mount the safe or not so you can shop for the appropriate options. You will find drawer safes with all different kinds of locks. These include combination locks, keypad locks, and biometric locks. Some safes just take a key. Figure out what type of lock you will find most convenient, and go from there. The most reliable locks are those which have earned UL ratings for their performance. These locks are proven to stand up to hand and tool attacks for a certain period of time. Be particularly mindful of this consideration if you are buying a drawer safe for a gun and there are kids in your household. 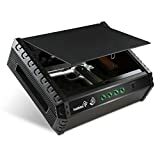 Children sometimes try to get into gun safes (and there are plenty of reports of them doing it successfully), and an inferior lock is not an option when it comes to keeping your kids safe. Drawer safes are particularly likely to be subjected to extreme violence by an intruder. Since they are relatively lightweight and portable, they may be thrown around, banged against surfaces, or dropped from a height. Purchase a solid steel safe which is going to be able to hold up to this kind of abuse. The door should resist efforts at prying. Of course, an intruder may simply make off with your safe and take the time to bust it open somewhere else. For that reason, you may want to consider mounting it. Some safes include pre-drilled holes and may even come with their own mounting kits. Check to see whether the mounting kit will allow you to place the safe where you want, whether that is in or against a wall, underneath your bed, or so on. Want to make sure that your possessions will stay safe through a fire? Shop for a drawer safe with a UL fire rating. UL 125: This rating will be sufficient to protect paper documents, photographic film, magnetic tapes, and computer disks. UL 150: This rating indicates that a safe can protect magnetic tapes, photographic film and papers, but it is not a suitable option for data protection. UL 350: If you only need to protect papers, choose this rating. If you are storing your handgun in your safe, you may need to grab it in a hurry. Single-handed access makes it easy to input your fingerprint or combination to unlock the safe. A spring-assisted door can open swiftly, allowing you to reach in for your gun quickly. A compression gas strut is a great feature in a drawer safe. It not only can aid in quick entry (see above), but also can ensure that when the door opens, it does so silently. This too may be of vital importance if you are facing an intruder. The last thing you need is for the sound of opening the safe to alert the intruder to your position. You need to get a chance to get the drop on him. If you are storing jewelry or other fragile valuables inside your drawer safe, you need to make sure they do not get scratched or scuffed. You should keep them inside their own separate boxes or pouches, but an extra layer of protection can be helpful. If an intruder bangs your safe around or you grab it in a hurry, jewelry items could easily fall out of their pouches. Look for a soft-lined interior which will protect these valuables. A foam lining can also help prevent your firearms from getting unsightly scratches and blemishes. Suppose an intruder manages to damage the lock to your safe, but you still need to get into it? Or what if you are out of the house, and one of your family members needs to access the safe, but cannot remember the combination? In situations like these, a key can be a lifesaver. With a key, you have a backup in case of lock failure. You also can distribute keys out to family members so that they have an alternative in case they forget the combination. Open with the No-Eyes keypad. This unique keypad design makes it possible to enter your combination even in total darkness. This also makes this a great safe to choose if you are visually impaired. Features a programmable lock. The lock can be programmed with any of up to 12 million possible access codes. Foam lining protects contents. Your guns, jewelry, and other valuables should not get scratched up inside the safe. Two backup keys are provided. If you forget the combination, you can get in with either of two backup keys. This safe comes with a security cable. This is a nice extra since it makes it less likely someone will simply carry off your safe. Your purchase is backed by a solid warranty. GunVault offers a 5 year replacement promise on your drawer safe. There may be some dependability issues. Some units seem to ship out with flaws. In some cases, they can be pried open with modest tools (an obvious security problem), and in others, they do not open at all when you need them to. Thankfully, these inconsistencies only affect a small percentage. 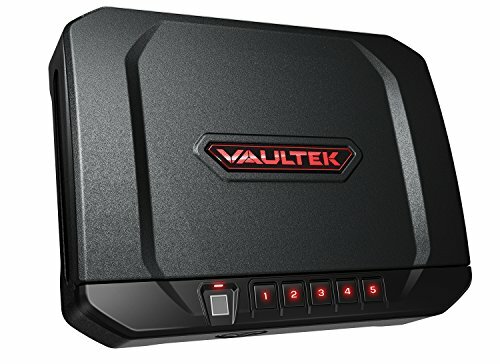 Those who are in search of a reliable safe at a reasonable price which includes some luxury features may be in the market for the VAULTEK VT20i. This safe is compact, sleek, stylish, and well-designed. It includes adjustable lighting, a proximity detector, and other smart features for ease-of-use and maximum security. This safe features solid construction. With two point latches built to withstand impact, pry-resistant bars, hinges mounted on the interior of the safe, and interior security brackets, this 16-gauge carbon steel safe keeps prying hands out. The VT20i is designed for fast access in emergencies. Need to get into your safe fast? The keypad lights up when you get close to the safe, and the door is built to spring open quickly once you scan your fingerprint or enter your combination. The safe is designed for portability. The VT20i was built with a low profile so you can stash it under a car seat. If you want to fly with it, you’ll be pleased to know it meets firearm guidelines as set forth by the TSA. The VT20i comes with a security cable. This cable is made out of 5 mm diameter steel, so it is hard to cut through. Your VT20i vault includes smart features. With the smart app, you can look up the log for the safe, adjust the lighting, turn sound on or off, see how your batteries are doing, and more. The history log has some gaps. The log is a useful feature in general, but it does not always seem to report attempts at failed entry. Some other events are missing as well. 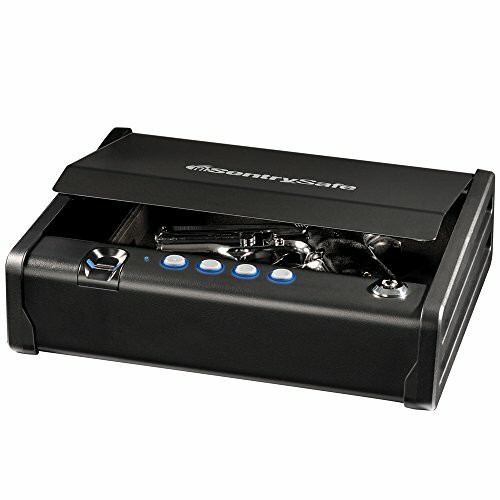 If you are in search of a biometric quick-access safe for your handgun, the SentrySafe QAP1BE may fit the bill. Measuring 3.2” x 12.1” x 9.9”, this safe features biometric technology so you can access your gun with nothing more than your fingerprint. A keypad is included as well. 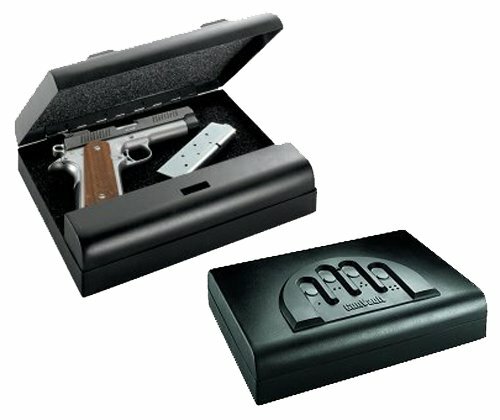 The safe is designed specifically for quiet, discreet use. The keypad is silent. The zero-feedback keypad lets you punch in your code in total silence. That way if an intruder is nearby, you do not need to worry about giving away your position when you try to access your firearm. You can access this safe quickly when you need to. The door features a compression gas strut. This pops the lid open automatically after you put in your fingerprint or combination so that you can grab your gun in a hurry. The door, like the keypad, is designed to operate quietly. A rugged build keeps contents safe. The safe is built out of solid steel and includes a pry-resistant door. An override key comes with the safe. Cannot get into your safe using your fingerprint or the keypad? Use the override key to reach your valuables anytime. The battery life is a bit short. It would be nice if one could use the safe for longer without needing to change the battery. The best battery life comes with SentrySafe’s branded alkaline AA batteries, but obviously this option is not always all that convenient. Where Should You Put Your Safe?